As Leah Roe placed her hand palm up on the table, she looked down at the design on her wrist. Simple black lines rose up and down to make a pulse design. As Leah Roe placed her hand palm up on the table, she looked down at the design on her wrist. Simple black lines rose up and down to make a pulse design. Mason Flippin, the tattoo artist, gently pressed down on her skin with his tattoo gun, permanently giving her a memento of the shooting that occurred on June 12, leaving 49 victims dead. Tattoo parlors across Orlando have come together to try to help support the Orlando community in the wake of the terrible attack on Pulse nightclub, including Realm, Age of Ink and Stigma. Several of them have given tattoos with Pulse designs and then donated the profits to various funds that directly help the victims’ families. Anna Eskamani, a UCF alumna and Orlando native, went to Stigma Tattoo Bar on June 21 for her tattoo. On her wrist, she got the word Orlando tattooed in rainbow letters with the last “O” in Orlando in the shape of a heart with a Pulse inside. She says that her tattoo is both a special remembrance and a call to action. Julia Lozada, a senior at UCF majoring in psychology, also went to Stigma and got a tattoo. Lozada was heavily involved with activism in Orlando’s LGBTQ+ community both before and after the shooting and wanted to get the tattoo to show that she stood in solidarity with the victims. Lozada said that she was greatly affected by the Pulse shooting because she is a member of the LGBTQ+ community. She also said that something that provided some relief to her following the shooting was seeing how many people got Pulse tattoos. “The fact that so many people of all different backgrounds got tattoos is great. It’s very comforting,” she said. Leah Roe, a 25-year-old technician for AT&T, called her tattoo artist Mason Flippin at Age of Ink and requested a Pulse tattoo on Thursday, June 23. She came in Friday at noon and worked with Flippin on a design. Roe said that she went to Pulse many years ago before she became a mother. 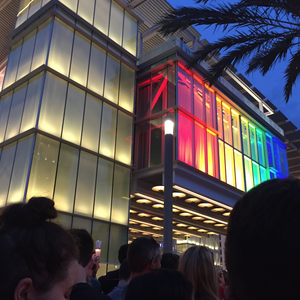 In the aftermath of the attacks, she became active in the Orlando community. She stood to block the Westboro Baptist Church protesters at victim’s funerals. She brought water to Tony Backe, a homeless man who spent his days keeping the flames in the vigil candles burning. And then she got a tattoo. “Our clients kept asking if we were willing to do it, and we all came together and said that it was a really good idea,” said Age of Ink tattoo artist Josh Perry. He estimated that so far about 50 people had come in for Pulse tattoos. After the tattoo was finished, Leah Roe looked down at her wrist and smiled. “This is for them,” she said.